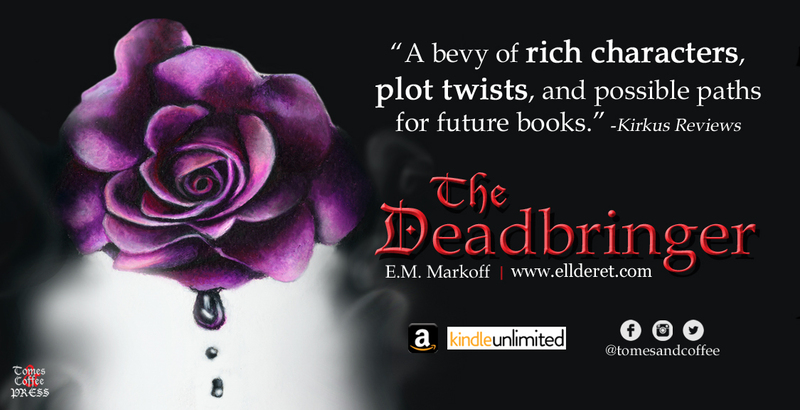 Thank you for your interest in The Deadbringer, book one of The Ellderet Series. If you have any questions, please feel free to email contact@ellderet.com or fill out the contact form. 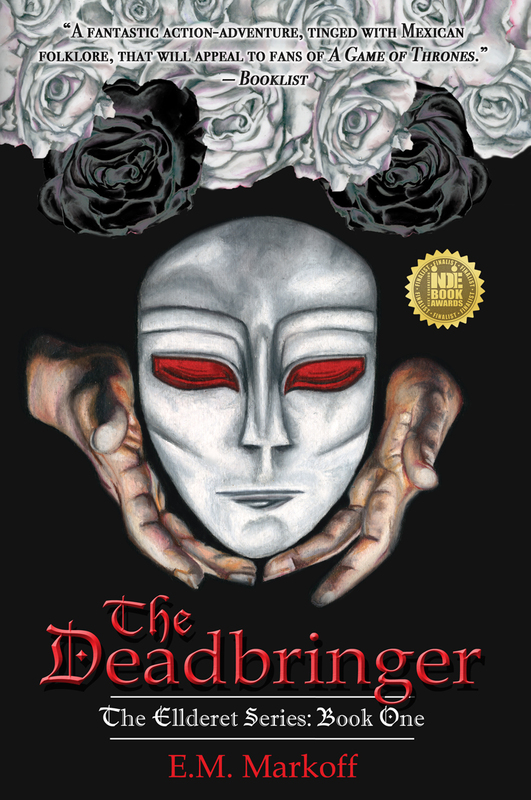 For more information over The Deadbringer, please read the FAQ and Review excerpts. IN THE WORLD OF THE ELLDERET, NO ONE IS INNOCENT AND NO ONE IS SAFE. The ashes of the Purging lie cold, and the next dance is about to begin in the Land of Moenda. Kira Vidal, a young Deadbringer, has escaped the fate of the rest of his kind, living peacefully with his uncle in the northern city of Opulancae. But then a strange man knocks on their door and a band of the Ascendancy’s fearsome Sanctifiers appears, hunting for Kira, and nothing will ever be the same. 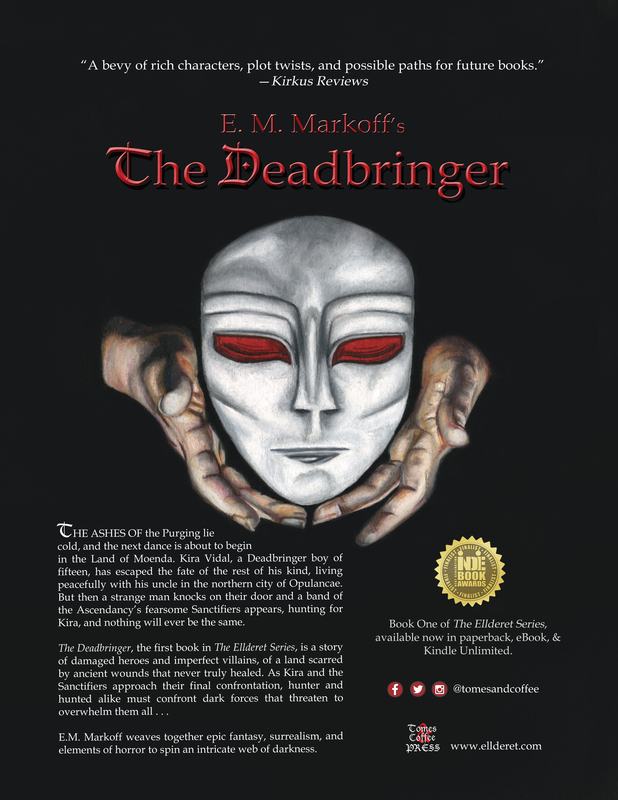 The Deadbringer, the first book in The Ellderet Series, is a story of damaged heroes and imperfect villains, of a land scarred by ancient wounds that never truly healed. As Kira and the Sanctifiers approach their final confrontation, hunter and hunted alike must confront dark forces that threaten to overwhelm them all . . .
E.M. Markoff weaves together epic fantasy, surrealism, and elements of horror to spin an intricate web of darkness. THE DAY HAD dawned gray, as it had for the past week, thick with storm clouds barring the sun. The gentle rains of summer had been late. Now, well into the fall, as if seeking to make amends for its tardiness, the rain turned dirt into mud that splattered onto everything, turned streets into shallow streams that carried away the filth that had piled up over the long, dry summer. But the dreary weather did not deter the bustle of Opulancae. Kira Vidal looked up at the midmorning sky with slightly uptilted, emerald-gold eyes and let the rain briefly wash his pale face. It felt cold and refreshing, just like the touch of the dead. Laughing softly, the tall youth turned his attention back to the bustle of the city and resumed his trek against the human current, his dapple gelding following close behind. He pulled forward the hood of his woolen traveling cloak, revealing long gloves that followed the length of his arms. Aside from the cloak, his clothing was entirely of supple black leather. He was eager to be done with his errands in the newer part of Opulancae so he could ride to the Old Town to visit Elia. And he was growing tired of seeing the long-worn signs nailed throughout the city warning that Ro’Erden and Deadbringers were not welcome. He continued on, placing an order for slate and fieldstone at one shop and an order for rough lumber at another. As was customary, he paid half of the cost up front and would pay the other half when the materials were delivered. “How’s your uncle?” asked the second shopkeeper, as he gathered the gold from the counter. “He’s well,” Kira replied cordially. Though young, his voice was rich, with just the slightest rasp. Lowering his hood, he took a leather tie from an inside pocket and began securing a cascade of raven hair that fell to his waist. It was damp and beginning to feel unpleasant resting against his back. “No, I know nothing of it,” said Kira, repressing a sigh. He hated gossip. He had indeed heard others whispering terrible rumors as he went about his errands, though it was the truth that their parlor had tended no one by that name. But he had learned that it was best to feign complete ignorance, as it kept his name and his uncle’s out of the rumors. He doubted the Bastion—the ruling power in the North—would intervene in local affairs for something as common as murder. Taking his leave before the shopkeeper had a chance to ask anything else, he swiftly mounted his horse and rode off toward the river road and the Old Town. HAD KIRA WALKED that day, he would have been able to reach the Old Town by descending the narrow flight of stairs that had been carved from the side of the high bluff that lined the river, upon which the newer sections of Opulancae had been built. But he had ridden and, since his horse could not sprout wings and fly like a bird or the long-dead winged serpents, he had been forced to take the river road, which went by roundabout way down the bluff to the river’s embankments. The Silver River had reached out beyond those embankments, submerging the ancient flood plain where the Old Town had long ago risen. Murky waters reached up to the dapple’s cannons and sloshed wildly as it trotted along. Kira’s heart ached with sadness as he neared the Old Town, for it had suffered from the heavy assault of rain, and the runoff pouring down the bluff from the surrounding city had only served to augment the damage. The ground beneath the town was a sea of knee-high water, and the modest wooden dwellings propped up on wooden stilts were islands. Despite their misfortune, the people waved upon seeing him. They had learned to endure the many changes that life by the river brought with it. What they had not learned to endure was the harsh nature of Opulancae itself—the city their river had helped foster. Kira dismounted and offered to help where he could, but there was little he could do that the people had not already taken care of. Still, he helped carry a bale of wool from a home that had sprung a leak, and then helped sort out the damaged material from the undamaged. “Here to see Elia?” asked one of the townsmen. Bidding them farewell, Kira sloshed along with his horse in tow until he reached a wooden house built upon thick wooden stilts, surrounded by hanging baskets filled with aromatic herbs. He stepped out of the water and onto the steps that led to the porch surrounding the house. His uncle had built the porch so Elia could hang her baskets to keep them from being damaged or washed away. He was about to knock when the door swung open. A slightly hunched, elderly woman barely reaching his chest looked up at him with pursed lips. Soft gray curls crowned her head. She motioned for him to enter. “Foolish boy, coming here with the rain. That uncle of yours knows full well the river tends to overflow during the rainy season. Next time I see him, we’re going to have a long talk.” She waved her frail-looking hands in the air, displeased. Kira had spent a few years as a child in the Old Town, and its people, in particular Elia, the old herbalist, held a special place in his heart. She had always been very kind to him and had taken it upon herself to be a very active part of his upbringing—much to his uncle’s dismay. “Though late this year, it is indeed the rainy season. Regardless, I wanted to see you.” He placed a gloved hand over her head and gave her a kiss through it. There was a heavy weight to her brow that he had never seen before. “Did something happen?” She dismissed his question with a humph and took a seat at the dining table. Elia was rather proud, and he knew better than to press her. Opening the oiled-leather bag slung around his shoulder, Kira pulled out two square-shaped bundles wrapped in waxed paper. He placed them on the table and unwrapped them, revealing two small cakes. “You’re not, and besides, I bought these with my money, not my uncle’s, so it’s my call how I decide to spend it.” She mumbled under her breath but said nothing more. Kira removed his damp traveling cloak, hung it on a hook near the door, and set about to making coffee. It was something he always did when he visited her. He laughed warmly. Her sharp tongue was one of the reasons he adored her so much. His uncle, on the other hand, often commented that instead of age having claimed her posture, it should have claimed her tongue. “And?” asked Kira, trying to hide his excitement. She sighed heavily once more. “Must something be wrong? Can’t an old woman sigh if she wants to?” Rising from the table, she walked over to an ornate cabinet and retrieved a red lacquer box. Taking her seat once more, she opened the box and held out a blue amber comb. Kira would have liked to spend more time with Elia, but the afternoon was passing and his uncle would be waiting. He rose and bent down to kiss her farewell, but he was stopped by her wrinkled hand. “None of this glove nonsense,” she said, protesting. “Either kiss me proper or don’t kiss me at all.” He concentrated and kissed a bed of gray curls. Her hair was soft and smelled like lavender. He would leave money with the candlemaker’s son and see to it that she wanted for nothing and had plenty of everything, as he always did. Bidding her farewell, he took his cloak, mounted his horse, and rode away from the shallow sea that was the Old Town. They left the spacious sitting room. As they entered the hallway, three small creatures scurried past. The smallest of the three, having trouble keeping up, ran back toward Eutau and went up on tiny hind legs. Eutau bent down and held out his hand. It climbed up his arm happily, swishing its bushy tail to and fro, and settled around his neck under an uneven mess of dark hair, where it proceeded to wash its short brown snout and the fluffy white tufts that adorned the tips of its pointed ears. “Such odd looking kittens,” the man said, his voice uncertain. The man said nothing more and quietly followed Eutau to the viewing room that was directly across from the sitting room. In the center, propped upon a worked-metal table, was a pine casket with dainty lilies carved into the sides. Eutau went back to the sitting room to indulge in a cup of tea while the man wept to his heart’s content. He drank slowly. The way the man was carrying on, there was no need to rush. The sitting room had always been his favorite spot in the house. Large stained glass windows generously lined one wall from ceiling to floor. Even on dreary days like today, enough light still managed to pour in. It saved him from having to ignite the oil lanterns for their clients. The other walls were a deep shade of red with white trimming, while the floor was covered with woven wool carpets inlaid with intricate scrolling designs. The carpets, along with many of the other furnishings, had been imported from Florinia, a city in the South. Recalling the man’s expression upon seeing his partner, Eutau smiled. It was more than a wig Kira fashioned for her. Belle had abandoned his neck in favor of seeking shelter underneath his high-collared shirt. Her efforts had burst open many of the buttons, exposing his chest and stomach. She pressed her tiny body up against his waist, shivering. Keeping one hand cupped around his shirt so she would not slip out—which she was precariously close to doing—and holding the teacup with the other, he took a seat on a carved wooden recamier. He carefully set his tea down on the green medallion upholstery to better focus on Belle. Coaxing her out of his shirt and onto his lap, he grabbed a nearby blanket, swaddled her in it, and laid her down near the headrest. He then began to refasten the buttons of his shirt but paused, his fingers tracing the length of a thick scar over his heart. Starting at the base of his neck and running all the way down to his waist were numerous uneven, red-black scars that marred his muscled body. He pulled up a long sleeve, revealing more scars on his arm, then sneered bitterly and began refastening the buttons. The soft pitter-patter of rain rapped against the stained glass windows, blurring the world beyond. It was getting late, and Kira had not yet returned from his errands. Eutau had no doubt that he had gone to visit Elia in the Old Town. If so, Kira would return soaked from head to toe, especially if the river had overflowed. Stew was the correct choice. Having finished his tea, Eutau went back to the viewing room and knocked on the door. “Can I come in?” he asked. A stuffy-nosed “Yes” answered him. Eutau took a contemplative breath. The man had indeed commissioned an intricate headstone: a broken column, three feet high, partially draped by a veil and lightly entwined with broken rosebuds. “Yes, it could shift. Your understanding is much appreciated.” Eutau inwardly counted his blessings. Some clients could be very demanding when it came to having intricate headstones done on such short notice. The man eventually left and, at last alone and with the day’s affairs finally settled, Eutau made a mental list of what he would need for tomorrow while he tidied up the parlor. He wrinkled his nose as he closed the doors to the viewing room. The faintest smell of rot lingered in the air. He took a handful of incense sticks out from the drawer of a writing desk in the sitting room, lit them, and placed them all about the first floor. Scented smoke quickly filled the air. Unlike you, my dear nephew, I am not fond of the smell of rot. The thought put an unpleasant frown on his face, for it reminded him of the growing friction between them. Eutau had dismissed it as concern over Kira’s growing abilities but, in truth, the answer was simple. Kira’s physical resemblance to his father as he aged was growing uncanny, as was his ever-increasing infatuation with interacting with the dead. It was his insistence in wanting to create a Doll that irked Eutau the most. Yet, despite resembling that man, Kira was nothing like him. Kira’s personality was more akin to his mother’s, as were his eyes. For Eutau, the eyes were what kept him from becoming lost in memories he fought desperately to keep buried. Brought out of his morose contemplation, Eutau abandoned the sitting room and went out to the foyer. He opened the front door. Before him stood a tall, portly man who worried his hands as he spoke. Eutau schooled his face to remain impassive, but inwardly he was a hard knot of anger and concern. Already the man was causing trouble by visiting the morticians’ parlors in Opulancae and giving the same idiotic speech. If rumors begin to spread of Deadbringers residing in Opulancae. . . Their only saving grace was that the man was aware that the Deadbringer he sought had ties to the Bastion and so was not a fugitive. Eutau pinched the bridge of his nose and hoped he was making the right decision. He was about to give instructions when it suddenly dawned on him that they had not exchanged formalities. “But what if the Bastion or this Lafont don’t believe my story and think I’m seeking a Deadbringer for some malevolent purpose? I don’t want to be locked away or put to death!” Stone’s voice had taken on an unattractive high pitch. Now he is concerned! Eutau thought, frustrated with the man and greatly wanting him to leave so he could speak with Kira and then step outside for a much-needed smoke. He wrapped an arm around Stone’s shoulder, shuffling him to the door. Eutau did not answer, instead repeating his instructions and adding, “Do not fret, for I personally will inform the Bastion of your plight . . . in detail.” The portly man went pale. It was the reaction Eutau had wanted to see. Eutau walked the man out of the parlor, waited until he had mounted his horse and galloped away, and then slammed the door shut and locked it. Only then did Kira walk out from the shadows, his clothes sopping wet and his feet bare. Eutau examined him. He left his boots in the kitchen. They must be a mess. “I made stew,” said Eutau. “I know. But we will eat together before you ride out, right?” Concern filled Kira’s eyes. He was well aware of the consequences that would result if word of his existence spread. Eutau smiled reassuringly and pressed the palm of his hand against Kira’s cold cheek. “Go change into dry clothes. I will warm up the food and we will eat together, as we always do.” Kira nodded and vanished up a flight of stairs. Alone, Eutau ran his fingers through his uneven hair and cursed to himself. Dammit, why now? He turned down the hallway that led to the kitchen. As he passed the viewing room, the faint scent of rot caught his nose.